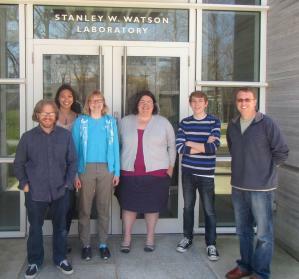 Members of the lab (Spring 2015) in front of the Stanley W. Watson Laboratory for Biogeochemistry (from left to right: Matt Johnson, Holly Moeller, Elina Peltomaa, Liz Harvey, Christopher Kirby, and David Beaudoin). We study predator-prey interactions among marine protists- single celled eukaryotes that dominate carbon fixation and its consumption in pelagic ocean food webs. My lab focuses on the phenomenon of mixotrophy, which is a common nutritional mode that combines the processes of photosynthesis and phagotrophy within a single organism. In protists, mixotrophy is broadly divided into "algae" that eat and "protozoa" that steal chloroplasts (i.e. kleptoplasty) or host algal endosymbionts. We take a trait based approach to studying mixotrophy in protists in order to better understand their ecological role, their impact on ocean biogeochemistry, and the evolution of these contrasting nutritional "strategies". We are also interested in studying interactions among marine phytoplankton and microzooplankton in an effort to better understand how protistan grazers modulate primary productivity and its fate.